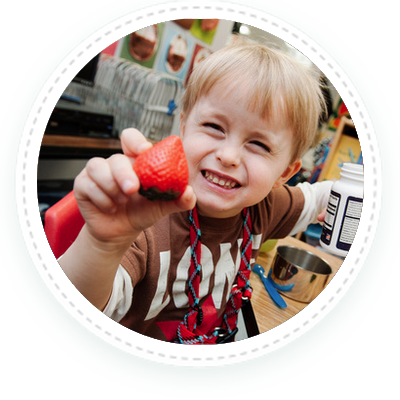 The Little Acorn Patch provides breakfast, morning and afternoon snacks, and lunch at no charge for the children enrolled in the full time program. All meals and snacks exceed the national standards established by the Child Care Food Program of the USDA. Breakfast is served between 7:30 a.m. and 8:30 a.m. Mid-morning snacks start at approximately 9:30 a.m. Lunch begins serving at 11:30 a.m. and mid-afternoon snacks are served following nap at 3:00 p.m. It is Virginia State law and the policy of LAP that no unauthorized food items are brought into the center. To avoid potential allergic reactions, please prearrange outside food with the LAP’s Administration or teacher. Any outside food brought in from home must have prior authorization, labeled with child’s name and dated daily. Any unused portions of food will be discarded daily.